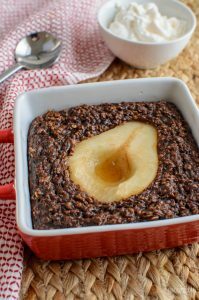 Delicious and totally indulgent Rich Chocolate and Pear Baked Oats to enjoy for breakfast or dessert. Another instalment to my delicious baked oat recipes. A perfect way to use your healthy extra b serving of oats when you fancy something sweet. This time we have Chocolate and Pear Baked Oats because chocolate and pear go amazingly well together. 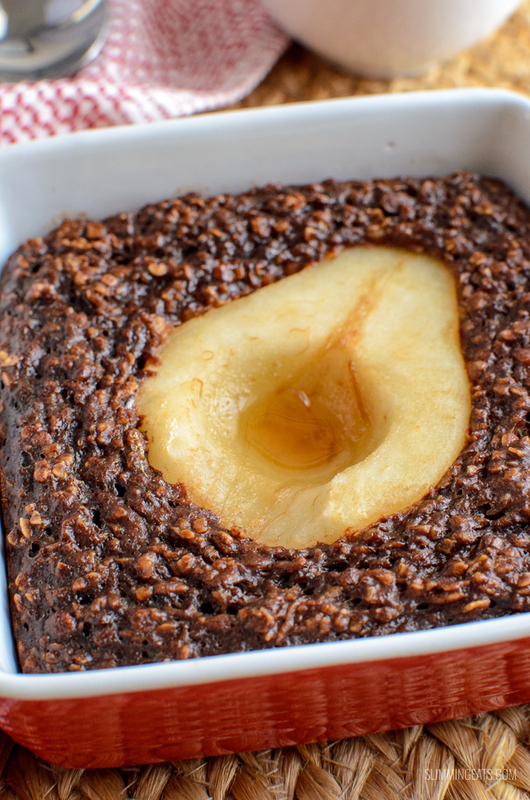 Juicy Ripe Pear baked in the centre of a chocolate flavour dish of baked oats, what more could one ask for? I know for me, I usually keep my baked oats until the end of the day. Making sure I save my healthy extra b choice, so I can enjoy it as an indulgent treat at the end of the day when the kids have gone to bed and I can put my feet up with a nice cuppa and thoroughly enjoy every mouthful. Totally undisturbed. Evenings can be my weak times, so it is important to have options for a healthier snack, whether it be using my healthy extra’s or my syns. During the day I am pretty busy, so I don’t generally struggle and if I do feel like a snack during the day a small piece of fruit is usually plenty. It’s always good to look at what are you weak times of the day so that you can be prepared by saving your syns to use on a treat if you don’t fancy something syn free. and if you like Treacle Sponge. This Pouding Chomeur is pretty darn close, it’s actually a French Canadian dessert that was created in Quebec, Canada during the first depression. It translates to Poor Man’s Pudding and really does remind me of a yummy treacle sponge. 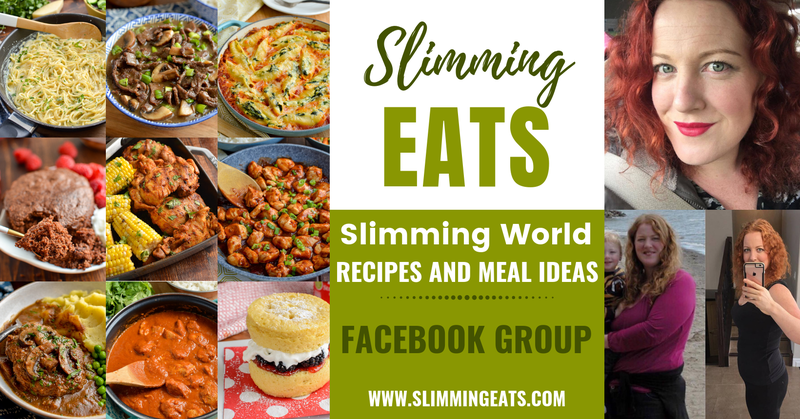 As well as all those amazing recipes, there are also there Cookies and Cream Oat Bites or Healthy Apple and Sultana Oat Bites which are pretty scrumptious. 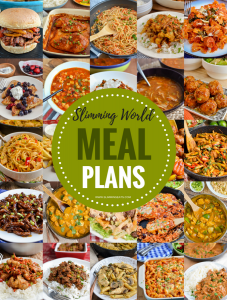 or you can also Head on over to my FULL RECIPE INDEX where you will find over 700+ delicious Slimming World recipes to choose from and all are searchable by syn value, meal type, ingredients etc. This Chocolate and Pear Baked oats is so easy to make. For the chocolate part, I use 100% pure cocoa powder. I get a lot of questions querying the syn value, just remember the syn value online is a generic syn value, brands will vary, there are so many different types of cocoa powder too, sweetened, processed etc. I, however, use pure 100% cocoa, and this is generally pretty low in syns at only 1 syn per level tablespoon (20 calories). You, therefore, may need to adjust the syn value depending on what one you use, just don’t treat all with the same syn value, it’s best to calculate using the syn calculator, for an accurate syn value. I tend to use Ghiradhelli or Trader Joes Cocoa Powder. 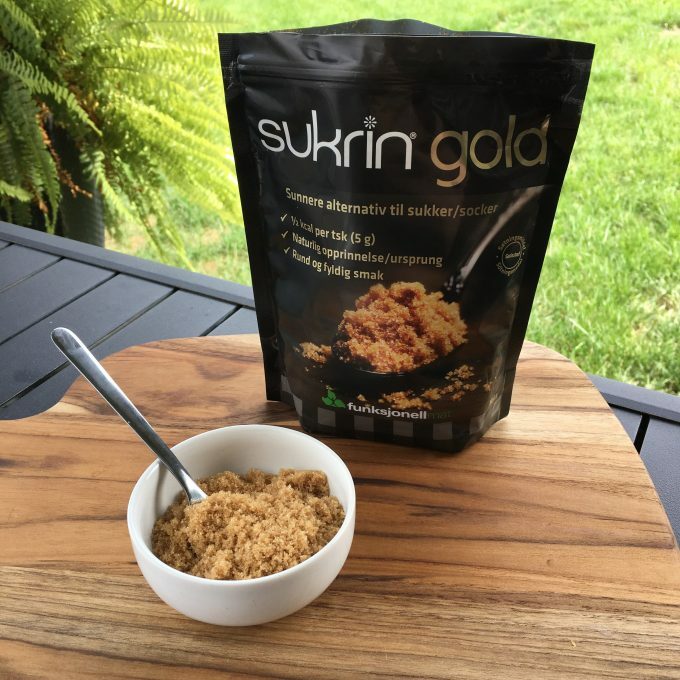 To sweeten the Chocolate and Pear Baked Oats, I like to use sukrin gold, which is a great alternative to brown sugar. Sukrin is the only sweetener I have found that is natural with no aftertaste but feel free to substitute with a sweetener of your preference. The pear is just a fresh ripe peeled pear, but remember as we are cooking this, the fruit becomes synned. Only fruit in it’s raw form is syn free. If you prefer you could use canned pear, just make sure you adjust syns if it differs. 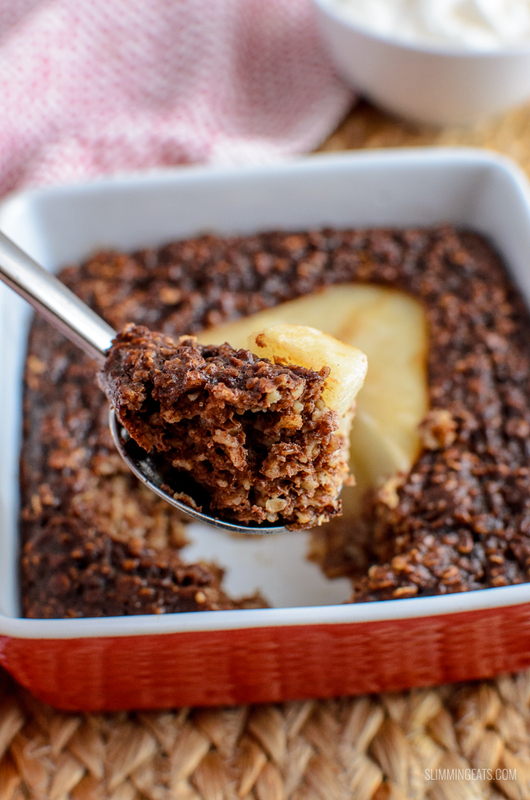 Don’t want to make one whole Chocolate and Pear baked oats dish? Then divide the mix to make 3 or 4 mini ones instead that you can enjoy throughout the day. Just watch the baking time, as they will bake slightly quicker, and instead of added half a pear, you can add some chopped up fresh ripe pear instead. Yum!! Add the oats, baking powder, 1 tbs of sukrin: gold and cocoa powder to a bowl and mix to combine. Add the egg, vanilla and Greek yoghurt and mix to combine. Spray oven proof dish with cooking oil spray to grease. Push the half a pear into the centre. Bake for approx 35-40 mins, until lightly golden and a wooden skewer entered into the centre comes out clean. The syns for the baking powder is negligible. Different type ovens may vary slightly in baking time. Please read the recipe write up for some important information about cocoa powder. Syn value of cocoa powder can vary from brand to brand. The three brands I use are 100% cocoa powder (not Dutch Processed) and are 1 tbs for 20 calories (1 syn). You should always double check the syn values of items which are synned, as brands can differ. I haven’t used muller light, but I can’t see why it wouldn’t work. Hi laura, what cocoa powder did you use? Was it pure cocoa? Was there anything else you substituted? Fruit only in its raw form is free, once cooked it is given a small syn value.